The new Design Museum will be the world’s leading museum of contemporary design and architecture, an international showcase for the many design skills at which Britain excels and a creative centre, promoting innovation and nurturing the next generation of design talent. London-based architectural designer John Pawson has remodeled the interior of the former Commonwealth Institute building in South Kensington. Pawson’s conversion of the 1960s building provides the museum with almost 10,000 square metres of gallery spaces – triple the space available at its previous east London location in Shad Thames. This allows the museum to simultaneously host a permanent display of its collection and two temporary exhibitions. The exhibition spaces are arranged around a large atrium in the centre of the building, where the underside of the distinctive hyperbolic paraboloid roof is revealed. The space is overlooked by wood-lined galleries and features broad flights of steps that double as seats. As well as the primary exhibition space, the building hosts the Swarovski Foundation Centre for Learning, the Bakala Auditorium, the Sackler Library and Archive and a Designers in Residence Studio. There is also a cafe, a restaurant, and a members’ room. The Design Museum will reopen on High Street Kensington on 24 November 2016. Tickets are now on sale for the opening exhibitions. The building opening date is almost two years later than originally planned. The Design Museum worked with John Pawson on the interior fit out of its building. OMA were responsible for the overall master plan and in conjunction with Allies and Morrison for the refurbishment of the exterior of the museum. Willmott Dixon Interiors worked on the £20m fit-out contract. Studio Myerscough designed the permanent display areas, while the museum’s visual identity has been overhauled by Fernando Gutiérrez Studio. The contractor is Mace. 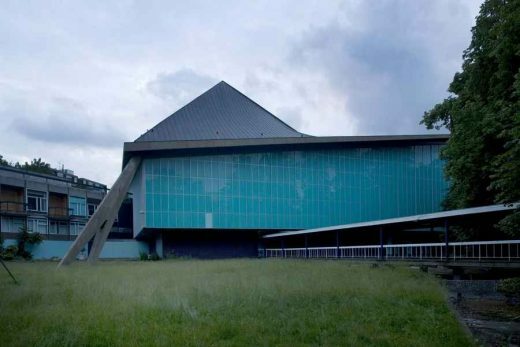 Developer Chelsfield and the Ilchester Estate donated the Commonwealth Institute building and land to the Design Museum, together with the cost of refurbishing the shell and core of the building. 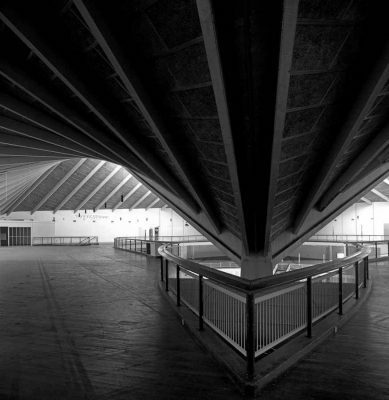 In 2012, photographer Koto Bolofo was invited to document the conversion of the former Commonwealth Institute into the new Design Museum. The 15 photographs on display represent 15 days in the building’s transformation. 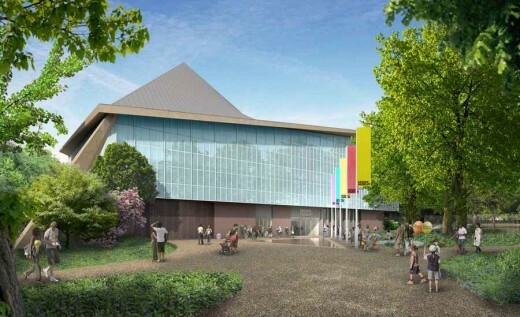 The move will give the museum three times more space than in its previous location at Shad Thames, with the brand new Swarovski Foundation Centre for Learning, 202-seat Bakala Auditorium and a dedicated gallery to display its permanent collection, which will be accessible free of charge. It will bring the museum into Kensington’s cultural quarter, where it will join the Royal College of Art, V&A, Science Museum, Natural History Museum and Serpentine Gallery. The Design Museum partnered with Phillips for an auction of design classics, contemporary masters and works from emerging talent, to support the creation of the new Design Museum in Kensington. Co-curated by architecture critic Deyan Sudjic, the Director of the Design Museum, and Alexander Payne, Worldwide Director of Design at Phillips, Time for Design was both a live auction on 28 April, and an online-only auction from 7 April – 2 May. All profits from the sale will be donated to the Design Museum’s capital campaign for its new home in Holland Park. London’s iconic Design Museum is set to open its doors at its new home in the Commonwealth Institute in Kensington High Street on 24 November 2016, almost two years later than originally planned. Willmott Dixon Interiors is working on the £20m fit-out contract that will see the Grade II-listed building converted into a major visitor attraction dedicated to contemporary design and architecture. Studio Myerscough is designing the permanent display areas, while the museum’s visual identity has been overhauled by Fernando Gutiérrez Studio. Lighting is being devised by Concord and Cartlidge Levene is creating the signage system. The contractor is Mace. Developer Chelsfield and the Ilchester Estate donated the Commonwealth Institute building and land, plus the cost of refurbishing the shell and core of the building. Further funding of £4.9m was provided by The Heritage Lottery Fund, while Arts Council England supported the project with a grant of £3m. The project had originally been announced in 2012 and planned for completion by 2014. However, a number of architectural complications caused the project to be delayed by several years. Willmott Dixon Interiors is creating galleries to accommodate one permanent and two temporary exhibition areas, as well as modern learning spaces, a library, auditorium, office areas and restaurant. Founder of the Design Museum Sir Terence Conran, Director Deyan Sudjic OBE and Chairman of the Trustees Luqman Arnold, joined by leading architects and designers, will attend a ceremony to celebrate the ground breaking of the new Design Museum at the former Commonwealth Institute, on Kensington High Street, on Tuesday 18 September 2012 at 10am. To mark this historic moment in the development of the Design Museum, a time capsule will be buried in the foundations of the new building. Leading figures in the world of design and architecture have been invited to nominate an object to be included in the capsule. They include the museum’s Design Circle members Sir Terence Conran, John Pawson, Reinier de Graaf, Zaha Hadid, Paul Smith, Norman Foster and Cecil Balmond. 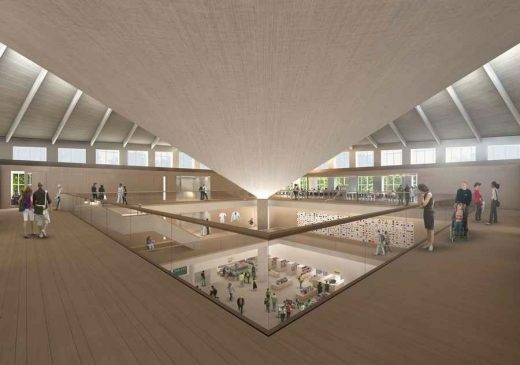 Designed by John Pawson, the new Design Museum, which will be the world’s leading museum of its kind, is expected to open in 2015. The move will give the museum three times more space, free access to its unique collection and bring it into Kensington’s cultural quarter where it will join the V&A, Science Museum, Natural History Museum, Royal College of Art and Serpentine Gallery. The museum has made great progress towards raising the necessary funds to complete the new Design Museum project, having secured £36.3 million to date in pledges and donations from: The Conran Foundation, The Dr Mortimer and Theresa Sackler Foundation, the Atkin Foundation, The Hans and Marit Rausing Charitable Trust, The Wolfson Foundation, The Garfield Weston Foundation, Sir Siegmund Warburg’s Voluntary Settlement, 29th May 1961 Charitable Trust, The Arnold Foundation and The Department for Culture Media and Sport, the J P Getty Charitable Trust and a number of generous individual benefactors. The Heritage Lottery Fund awarded the project £4.65m in July 2012. Chelsfield, developer of the whole site, has donated the building and land valued at £15 million, together with £20 million towards the cost of redeveloping the building. The Design Museum today unveiled plans to create the world’s leading museum of design and architecture at the former Commonwealth Institute building in Kensington, London. Designs for the site have been produced by two of the world’s most innovative architectural practices: John Pawson has redesigned the interior of the Grade 2* listed building and OMA has planned the surrounding residential development. The move will allow the new Design Museum to become a word class centre for design, nurturing British talent and its international influence on design of all kinds. It will bring the museum into Kensington’s cultural quarter, where it will join the V&A, Science Museum, Natural History Museum, Royal College of Art and Serpentine Gallery, creating a platform for the promotion and support of the next generation of creative talent. The 1960s Commonwealth Institute building has lain dormant for over a decade. Its refurbishment will give a neglected London icon a new life and purpose and will revitalise an important area of West London. In July 2010 the Royal Borough of Kensington and Chelsea granted planning permission to Chelsfield Partners and the IIchester Estate to modify the Grade 2* listed building and for a residential development. The design team for the new project has been assisted by Lord Cunliffe, a leading member of the original architectural team for the Commonwealth Institute in 1958, and by James Sutherland, the building’s original structural engineer. The Museum announced today that The Dr Mortimer & Theresa Sackler Foundation has pledged to support the project, making a generous donation to create The Sackler Library, a learning resource at the heart of the new Design Museum. Other major donations include The Conran Foundation, which has pledged £17m, The Heritage Lottery Fund which has made a first stage grant towards an application of £4.95m, The Wolfson Foundation, The Sir Siegmund Warburg’s Voluntary Settlement, The Hans and Marit Rausing Charitable Trust, The Atkin Foundation and, in addition, a further £2.75m has been raised in early stage fundraising from a small number of individual donors. 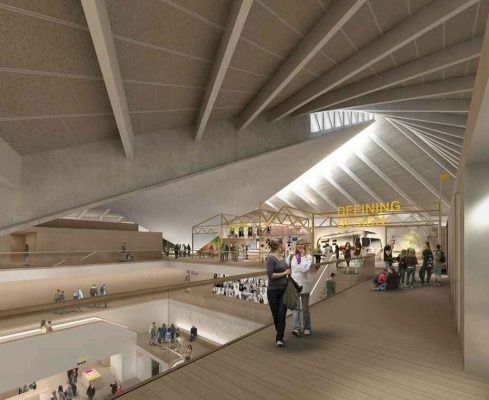 Culture Minister Ed Vaizey, said ‘It is immensely exciting to see the plans for the new Design Museum at the Commonwealth Institute in Kensington. The UK leads the world in design and architecture and it is entirely appropriate that we should be creating the world’s greatest Design Museum at this iconic London landmark. As part of London’s Open House weekend on 17 and 18 September 2011, the future home of the Design Museum at the former Commonwealth Institute building will offer public tours before construction begins in earnest. It will be the last chance for the public to see this remarkable 1960s site before it re-opens as the new Design Museum in 2014. The museum’s move from its current site at Tower Bridge to High Street Kensington will triple the space in which to show its world-class collection, and greatly expand its education and public events programme. The new Design Museum will be a platform for promoting design as a national asset, and supporting the next generation of creative talent. The move brings the Museum into Kensington’s cultural quarter, where it will join the V&A, the Science Museum and the Royal College of Art. Saturday/ Sunday tours every 45 minutes 10.30am – 4.15pm. Last tour 4.15pm. Tours of former exhibition hall led by Design Museum staff. 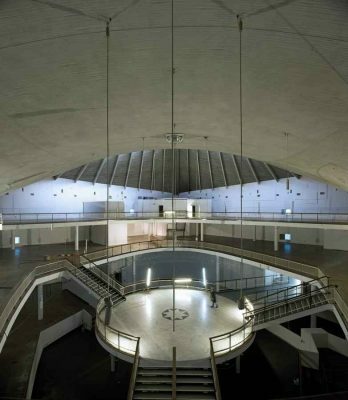 The interior of the former Commonwealth Institute will be transformed by internationally acclaimed designer John Pawson, and the surrounding development is the vision of Rem Koolhaas. The design team has been assisted by Lord Cunliffe, a leading member or the original architectural team for the Commonwealth Institute in 1958, and by James Sutherland, the building’s original structural engineer. The Royal Borough of Kensington and Chelsea granted planning permission for Chelsfield’s scheme to modify the Grade 2* listed building in July 2010. The project is to be completed by 2014. John Pawson made his name in the late eighties / early nineties with vrious ‘minimalist’ designs, architecturally related to the work of Claudio Silvestrin. We recently featured his house in Milan. Plans for a new headquarters for the Design Museum on the site of the former Commonwealth Institute in Kensington High Street were approved by the Planning Committee of the Royal Borough of Kensington and Chelsea last night. 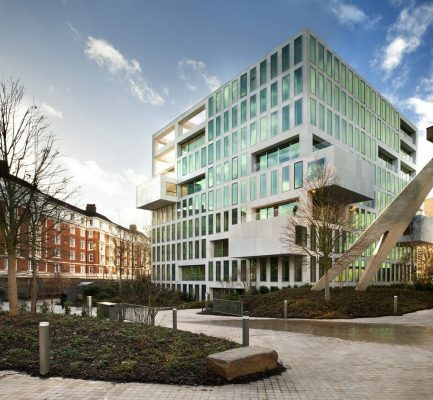 The scheme by Rem Koolhaas’s award-winning Office for Metropolitan Architecture was submitted by Chelsfield Partners and the Ilchester Estate in April 2009 and revised in August 2009. The move will give the Design Museum three times more space and enable the organisation to create one of the world’s leading design museums in London. 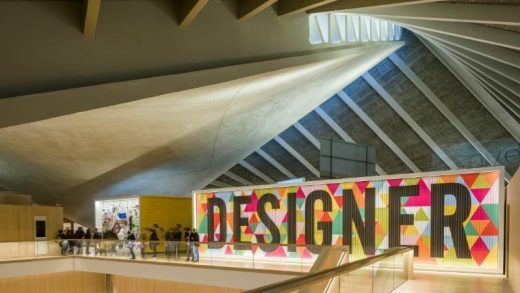 Deyan Sudjic, Director of the Design Museum comments “We are thrilled with the outcome which now opens the way for the Design Museum to realise its vision of becoming a world leading creative centre for design and architecture”. The Parabola (the new name for the former Commonwealth Institute building) has been practically unoccupied since 2001. The building’s refurbishment and new use will give a neglected London icon a new life and purpose and reinvigorate this important area of Kensington. The design team has been assisted by Lord Cunliffe, a leading member of the original architectural team for the Commonwealth Institute in 1958, and by James Sutherland the original structural engineer. 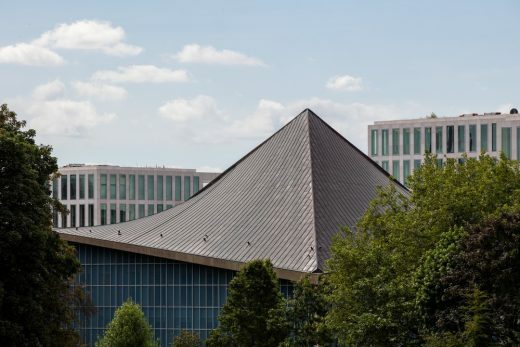 The Design Museum’s future use of the building will be part-financed by the developers, with a contribution of £20 million toward the cost of the restoration, and the donation of a long-term lease at a peppercorn rental. Revisions have been made to the planning application and submitted last week for the new home for the Design Museum and associated residential development on the site of the former Commonwealth Institute in Kensington High Street. The revisions, made in response to comments by the Royal Borough of Kensington and Chelsea, local residents and English Heritage, include a number of changes to the Parabola, a 1962 listed building, a revised landscape scheme, a number of height reductions to the residential development and enhanced views of the Parabola building from Kensington High Street. The original planning application was submitted in April 2009. The sequence of arrival and space disposition has now been changed to more closely resemble the existing arrangement with arrival over a bridge on top of a water feature into the building with a platform giving access by stairs throughout the building. This sequence will be detailed in a further submission by the Design Museum later and retains one of the principal design features of the building. Other changes in the building include open floors at all levels and the new openings in the floors have been enlarged. 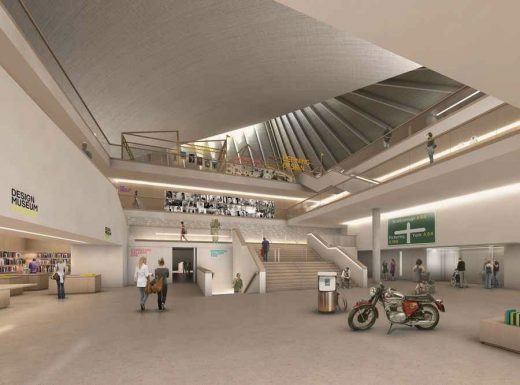 Stairs and lifts have been deferred to the Design Museum’s later fit-out applications. There have been major revisions to the landscape designs which now provide a park setting and incorporate a water feature and access route which is similar to the original concept. The height of the Park, Garden and High Street residential buildings has been significantly reduced and views from the street and park enhanced. The site and buildings (Grade II Listed) have had a chequered history since the decline of the Commonwealth Institute. From 1996 onwards, the country exhibits were removed and the building was used for exhibition and conference facilities. It finally closed in 2004 as these uses failed. There have been six failed attempts to obtain lottery funding and other grants and there have been proposals for a wide range of uses which have all failed because of the difficult nature of the design of the original building which was constructed for a very specific purpose on a very limited budget. The Design Museum’s future use of the building will be part-financed by the developers, with a contribution of £20 million toward the cost of the restoration, and the donation of a long term lease at a peppercorn rental.